As this year comes to an end and everyone is gearing up for a new year and a new virtual tour system from RTV, we would like to take a moment to say thank you to all of our virtual tour providers that have helped to make this year a very successful one. With a steadily growing provider base and new national virtual tour accounts coming on, we know you’re going to be very satisfied with what next year has to bring. From everyone here at Team RTV, we wish you and your families a very Happy New Year and get ready for RealTour Fusion! One thing we’ve gotten really good at over the last three years with the coaching of team RTV is helping real estate listings here in Metro Detroit get the most exposure possible. When I’m talking with a new client over the phone I ask them what they’re currently doing to get more exposure online. This is a question most of them have a hard time answering. I then take them through one of our powerful hit reports and show the traffic sources of one of our virtual tours that has our exposure engine and then one that does not. The proof as they say is literally in the pie. Our virtual tours rank naturally in the search engines, get converted to video, appear on craigslist, show up in our blog, get emailed out to all the local realtors and of course go to all the major real estate portals. I explain how this takes constant work, time and effort on our end and this always justifies the small cost to add on the exposure engine to a listing. This one is simple, in a slow Real Estate Market you need to do whatever you can to get that home in front of as many people as you can! 87% of potential home buyers look at homes with Virtual Tours FIRST! Recently, I was at a homeowners house doing a Virtual Tour and she said to me that they where looking to buy a Home out of state and they relied on Realtor.com in looking. She said that they looked at homes with Virtual Tours 1st, homes with multiple photos 2nd and did not even bother looking at homes with one or no photo. She thought with only one or no photo that they were trying to hide something. The next time you’re talking with one of your customers take a moment to ask them they steps they’re taking to gain more online exposure. You will be surprised how much more you can bring to their marketing plan. Hello RTV virtual tour providers out there! We’re very excited about how well our virtual tour business has taken off. Today our Facebook ad that just broke out targeting local real estate agents along with an e-mail ad to all of our local Realtors offering a 1st real estate virtual tour discount. So much is going on right now! 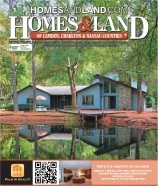 Buzcam360 V-tours is now HD360 Vtours, and we recently shot the cover of the local edition of HOMES&LAND magazine. Best of all this edition also features our half page ad on page 7. In addition to this, the Amelia Island Nassau County Association of Realtors has invited us to join the local board as an affiliate and wants us to assist them as their official photographer which we plan to start in 2012!! Things could not get any better for a virtual tour business start up. As of last week it became necessary for me to go on referrals only as a real estate agent in order to focus completely on HD360 Vtours. We just completed 4 Virtual Tours in our first week of being a full-time virtual tour provider, and every day looks brighter than the last. The new RTV Fusion system sounds so exciting with it’s new capabilities and great looks. We really feel that it will make HD360 Vtours the preferred virtual tour provider for our area and are extremely pleased that we aligned ourselves with RTV for company start up. A great big thank you to the entire staff at RTV for making it possible for us at HD360 Vtours to provide the best virtual tour product and support available in the virtual tour business today. Happy New Year to everyone at RTV! Are you concerned about how to ensure your home gets the best marketing and exposure to qualified home buyers in today’s market conditions? Did you know that 84% of buyers turn to the Internet to look for homes? Do you ever wonder what makes certain homes capture their time and attention? Properties for sale that provide more information and more photos of course! Listings with plenty of information including a 360 tour of the home get the most attention online. In fact 99% of consumers surveyed prefer listings with virtual tours and multiple photos. Seems pretty obvious right? You all did a little shopping here over the Holiday season right? Now imagine if on Amazon.com or eBay, an automotive supplier only showed a couple of lines of text describing each item offered. No photos, no feature rich information about the specifications, the warranty, or how to find or purchase the item. You wouldn’t spend much time on that type of website would you? In fact, if you’re like most of us you would close that site down and run to any other site out there serving up HD images and more description. Not too long ago, providing a quality, rich media showcase of a home for sale was a luxury item. Now it is demanded by most buyers and is one of the minimum requirements for a real estate professional to effectively market a seller’s home to attract buyers. No longer is it acceptable to just put a sign in the front yard, purchase a 3 line classified ad, send out a batch of “Just Listed” postcards to the neighbors and hold an open house. Real estate professionals who are proactive in leveraging the power of the internet must use online virtual tours and it’s your job as their property marketing partner & photographer to remind them of this fact. In 2012 don’t forget that you now more than ever have the numbers stacked in your favor when you go into a presentation. They’re going to use someone….why not you? The Florida Panhandle real estate market is very competitive. A large inventory of new and existing homes and condominiums creates a challenge for listing agents to make their listings stand out. No guaranteed return on investment, makes your marketing budget decisions of the utmost importance. The local newspaper and real estate publications are effective ways to reach local buyers however, in an area where most of our buyers come from out of town, these may not be the most cost-effective choices. Even local buyers are likely to turn to Internet sources to ensure they are getting the most up to date real-time information. A far wider audience can be reached with Internet advertising. Further, in most cases, a much larger amount of information can be displayed. Your website, and others you choose to advertise on generally offer the option of multiple photographs and placement of virtual tours. The vast majority of home buyers, looking locally or relocating, now use the Internet in their search. Viewers want to see multiple images. Buyers enjoy being able to use an interactive virtual tour. Decisions are made from how a listing is represented on the Internet. Make sure your listings are properly represented.On-line advertising is in many cases the more affordable and more complete way to go.